Weekend Update: The new Boeing 787 Dreamliner paid a visit to American Airlines and DFW airport on Friday. I’m planning to post my photos from the event on Monday, but here’s a sneak preview. 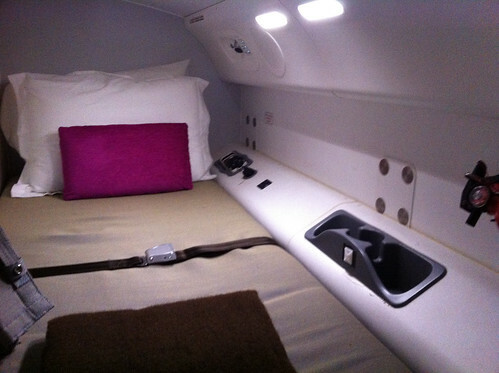 This is a photo of the crew rest cabin that’s located in an upper level compartment in the front of the plane. There’s another crew rest cabin in the back that looks exactly the same. Here’s a photo of the forward crew cabin. I’ll have some more photos from the event on Friday and will post them early this next week. So go here to enter. I hope everyone is having a good weekend. And Happy Mother’s Day too all the moms!! Paper. I think until every carrier offers it and it’s mainstream technology, paper is still better. I’ve been using the mobile boarding pass, but am worried the battery will die or technical glitch. When it works, it’s great.